The word hydraulics to me evokes pictures of pumps, valves and engineers – anything to do with liquids and water pressure. A little critter that wandered across my outdoor furniture setting recently is powered by hydraulics. You have probably all seen these tiny little spiders (pictured) which, with a mighty leap, suddenly disappear only to reappear many body-lengths away. They are aptly called Jumping Spiders and make up the family Salticidae which, numbering nearly 6000 species, is the largest family of spiders in the world. Jumping Spiders are distinguished by their leaping motion which they use to hunt prey (usually small insects) or avoid being preyed upon. They do not have large back legs as does a grasshopper. The spring in its step comes from hydraulics, an explosive change in the ‘blood pressure’ in the back pairs of legs which rapidly extends them and sends the spider forward. The front two pairs of legs are used for grabbing prey. 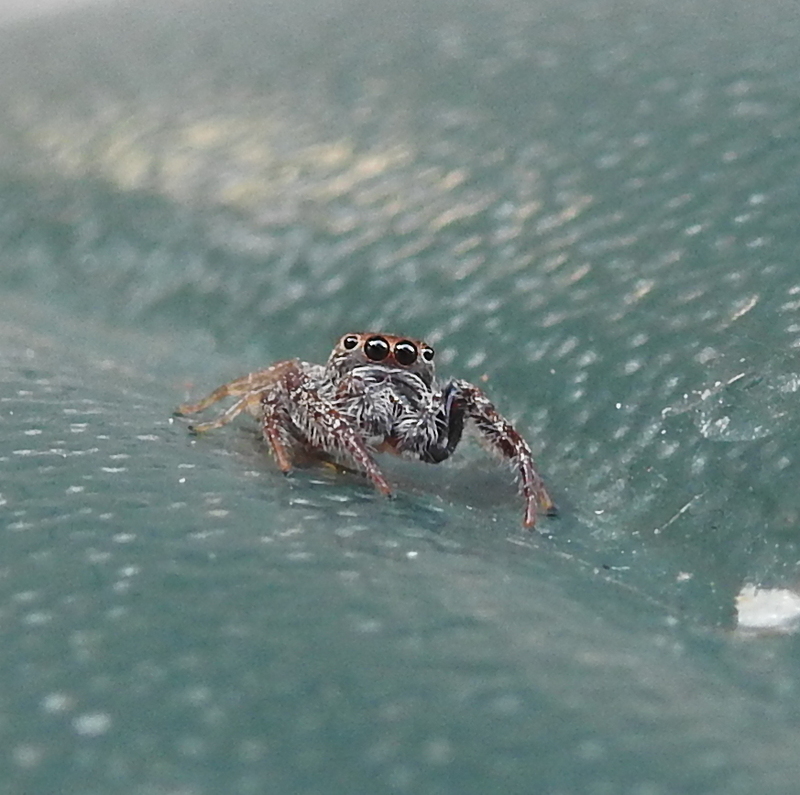 The other obvious feature of jumping spiders is the rectangular shaped head into which four pairs of eyes are set in such a way (see photo above) as to afford the spider a 360 degree field of view. Jumping spiders have extremely good vision in both the visible and ultraviolet parts of the spectrum. Two of the eyes are much larger and face forward. They cannot rotate like the human eyeball. Instead the retina at the back of the eye can swivel to change the field of view. And hydraulics again, the focusing is done by manipulating the liquid in the eye structure to bend the light entering the eye.